I have a page on Facebook called, you guessed it, Moore or Less Cooking! 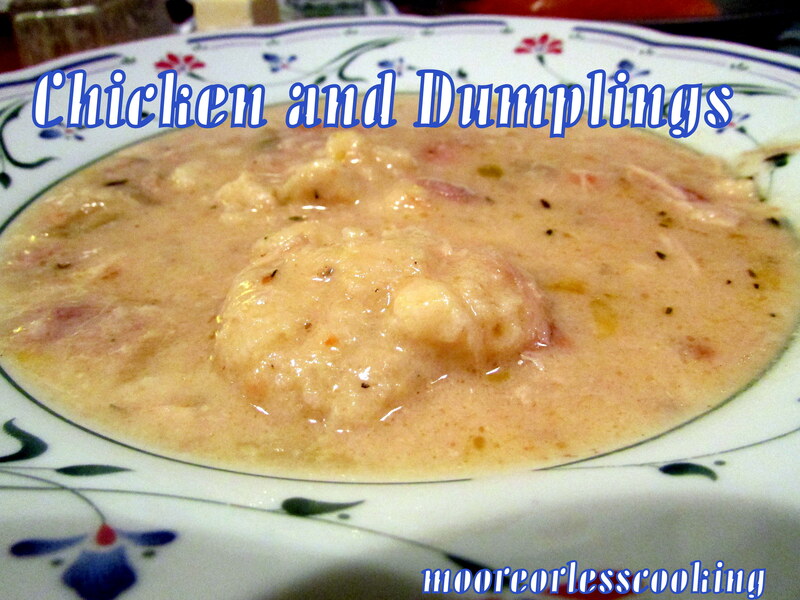 I just had a chicken party over on this so called page and so many yummy recipes were shared including some really yummy chicken and dumpling recipes. I’m the type of person who once I get something stuck in my head, I have to do that sort of something. Today this sort of something is make Chicken and Dumpling’s. If you aren’t into comfort food, just walk away, this delicious recipe is not for you. Thank heavens I have some fabulous readers who talked me through making the dumplings because I thought I had failed, but the trick is not to lift the lid while they are cooking, but I am an impatient one, I tried and tried not to lift the lid, walked a lap around the house, sure enough, they were perfect, do not be tempted! Enjoy this wonderful soup, it made my day so much better. Sprinkle chicken pieces with salt and pepper, then dredge both sides in flour. Melt butter in a pot over medium-high heat. In two batches, brown chicken on both sides and remove to a clean plate. In the same pot, add diced onion, carrots, and celery. Stir and cook for 3 to 4 minutes over medium-low heat. Stir in ground thyme and turmeric, then pour in chicken broth and apple cider. Stir to combine, then add browned chicken. Cover pot and simmer for 20 minutes. While chicken is simmering, make the dough for the dumplings: sift together all dry ingredients, then add half-and-half, stirring gently to combine. Set aside. Remove chicken from pot and set aside on a plate. Use two forks to remove chicken from the bone. Shred, then add chicken to the pot. Pour heavy cream into the pot and stir to combine. Drop tablespoons of dumpling dough into the simmering pot. Add minced parsley if using. Cover pot all the way and don’t peek!Continue to simmer for 15-20 minutes. Check seasonings; add salt if needed. Allow to sit for 10 minutes before serving.